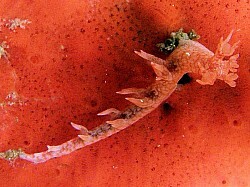 This nudibranch is described in Gosliner's guide to occur from Port St. Johns to Durban. It is not 100% certain that the animal shown in the images is this species, as it was found at depths deeper than it is known to occur (3m maximum), as well as substantially further south than the known range, but the colouration and overall appearance are similar. The Bornellidae are part of the suborder Dendronotina, to which belong the often visually similar Tritoniidae - the tritonias, which also have appendages along the edge of their bodies. This family is better represented in South Africa.